its operational areas. The company has been consistently working towards initiating programmes for regular mentoring and creating opportunities for their overall socio-economic enhancement. In alignment with the government’s Skill India initiative The Cairn Enterprise Centre (CEC) provided skill training, career counselling and linkage to employment opportunities to over 12,000 youth including women since 2007. Barmer District with its low literacy rate, lack of quality education and poor community awareness are contributing to unemployment, poor health and low income in the region. While Cairn India has triggered economic growth in the region through its operations, it has also enabled large scale community development to ensure inclusive growth. Through the Cairn Enterprise Centre (CEC), various income generation activities have also been introduced to empower women. CEC also provides financial support to help these women start their own businesses. One such example of the impact of CEC is that of Chanchal Jain from conservative family aspiring to carve her own identity at a very young age. CEC helped Chanchal along with other youth of Barmer trained for entrance test of HDFC bank which is one of the largest private banks in India. In a month long course, they were not only taught aptitude, numeric ability and English proficiency but their personality was also groomed to make them ready for corporate life. Post the training at CEC, Chanchal was immediately selected by HDFC and today she is progressively climbing the corporate ladder and has now become a role model for many girls of her age in Barmer. Breaking the barriers of gender roles is the Masonry training initiative by cairn in the region. In a move away from the usual vocational training courses for women such as sewing or craft-making, Cairn India has empowered 50 women to be trained masons. The masonry training proved to be a great boon for Soni Devi, a 28 year old widow at Bhimda village in Barmer. As a value addition all the women participants of the masonry training are also being made literate through a special provisional literacy programme specifically designed for them. This ensures that after completion of the training, the women are not only financially independent but are also empowered to face new challenges. Today, Soni and other inspiring women masons are now helping to build toilets as part of the Swachh Bharat Abhiyan. Surasaniyanam is a remote village in East Godavari district in coastal Andhra Pradesh. Absence of requisite education and skills resulted in unavailability of sustainable livelihoods, increased migration and socio - economic challenges. The Ravva JV onshore terminal, operated by Cairn India, is the village’s first and only tryst with industrialization. As part of its endeavour to make a positive difference in the lives of the local community, Cairn and Ravva JV has been actively involved in implementing community development projects in and around Ravva operational area. These initiatives have touched the lives of people across different strata of society by creating sustainable livelihoods. Another unique initiative is -- The Suraksha brooms making unit, started in December 2014 with 6 women as direct beneficiaries. Today, about 120 poor households from the project area are tied-up with this brooms unit as raw sticks suppliers. 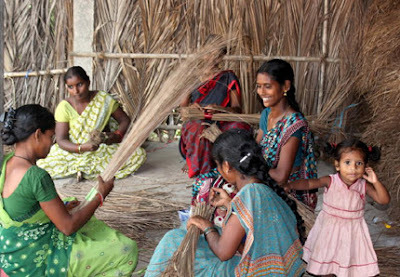 The Suraksha brooms and SurakshaAgarbatti making unit is touching the lives of community members in villages around Cairn India’s operational areas in Ravva. The project has helped women, who are the driving force of this business, to save money, live a better life and help educate their children. Cairn India has also initiated the Dairy Development Programmein Barmer which has helped extend monetary benefits to villagers. Cairn India developed a model through which the dairy farmers would benefit and generate more income. Women are an important and integral part of the Dairy Development Programme. The programme helps women sustain their socio-economic status in the community. In the remote, desert district of Barmer, farmers struggle to earn enough money to support their families. They raise a limited variety of crops and rarely introduce new innovation.Cairn's BarmerUnnati project, in partnership with TechnoServe, is working with farmers to introduce new crops and innovate new livelihoods. Under this project, Leelawati, a village woman was introduced to Oyster mushroom cultivation. She sold 45 kg packed mushroom under the brand ‘BarmerUnnati’ to local hotels and restaurants and Barmer market and earned a profit of INR 3130 within a period of 60 days. Today, Leelawati feels empowered and elated that she is able to support her husband and contribute towards the economic development of her family. Special focus has also been given to improve health, sanitation and general awareness among the women. Project Rachna stands for Reproductive and Child Health Nutrition & Awareness (RACHNA) and the single point agenda of implementing this project is to ensure woman and child wellbeing. The project is being implemented in three blocks of Barmer district namely - Baitu, Sindhari, Dhorimanna. The project’s goal is to contribute to significant reductions in maternal and infant mortality, to improve menstrual hygiene and reproductive health of adolescent girls and women in Barmer district. Under this programme, Cairn India has helped the local self-help group to set up two Sanitary Napkin Production units in Barmer. Each of the manufacturing units is operated by a local women’s self-help group, who have been trained on the machinery and the process. At present a single woman can earn up to INR 50 per day and an average daily production of 750 sanitary pads per day and besides generating awareness on importance of better menstruation hygiene management among adolescent girls and women. Further, contributing to the Government of Rajasthan’s initiative of “BetiBachaoAbhiyaan”, Cairn India has introduced one of its kind campaign to celebrate the birth of a girl child around the operational areas. Under this campaign, the company presents a “New Born Baby Kit” to parents of the baby girl born in government hospitals and institutions. This kit consists of a clean towel, two sets of dresses, socks, toys, a mosquito net, and an immunization check-list. What makes the kit unique is the message on how a baby girl brings happiness to the family. The campaign will allow to increase awareness on the importance of institutional delivery which will positively impact Infant Mortality Rate (IMR) and Maternal Mortality Rate (MMR). Cairn India, through various unique initiatives, aims to encourage more women to cross social barriers and chart out a new future for them and their families.